The #215th installment in my long-running "Faces of Faery" series. The original painting is up for auction on eBay HERE, with bidding starting at just one penny to give everybody a chance. The auction will end the evening of November 22nd. Click HERE for the auction and for additional photographs - she is all ready to hang, with 2" deep gallery style cradled black boards on the sides. We also have Hand Embellished Limited Edition Canvases - the same size as the original - 6"x6" - these are hand accented by me in acrylic paints, signed, numbered, dated, and the canvases are wrapped on wood with a hanger on the back so they are all ready to pop right up on your wall! The last ones EVER made, now sold out everywhere else! Now SOLD OUT - the very last hand embellished Limited Edition Canvases for both "Divine Hand" and her sister "Speak No Evil" - the #25/25 of each edition - are now up for auction on eBay. Each 8"x10" canvas has been hand embellished by me (Jasmine) in acrylic paints, signed, dated & numbered #25 out of 25 - the last ones I will ever make. They are wrapped on boards with a hanger on the back, ready to hang onto your wall. To give everybody a chance, these are up for eBay auctions starting at just one penny. No more will ever be made, so if you would like a Lt. Ed. Canvas of either of these (or both!) - here is your final opportunity! A special one-night-only event - Jasmine will be at Pop Gallery at Downtown Disney at the Walt Disney World Resort in Florida to host a "release party" for her new Fairy Mischief card game (for all ages). Click HERE for details. 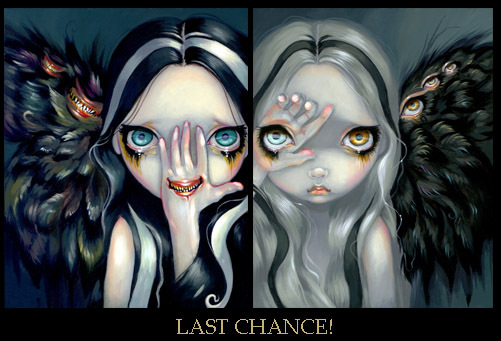 Jasmine's BIGGEST SHOW OF THE YEAR - her yearly solo show at Pop Gallery - "Myths & Mermaids" at Downtown Disney! A special two-night event - Jasmine's premier event of the year - "Myths & Mermaids" is an enormous themed exhibition of never-before-seen mermaid and mythological paintings! Details to come soon! Click HERE for details.